Edema Strips are a safe, comfortable way to reduce swelling and bruising. Simply apply this light, elastic tape over any swollen area and it immediately goes to work increasing lymphatic drainage. Also called fan strips because they are applied in a fan pattern over the area of swelling or bruising, many people simply call them magic strips because they work so well and so quickly. With no latex and no medications, Nasara QuickStrips can safely and gently relieve swelling from surgery, medical conditions or injuries, including swollen feet and ankles, sprains, lymphedema, and ankle edema related to pregnancy or congestive heart failure. Each 10" strip has a 2" solid anchor end and five 8" 'fingers' that can be applied over any swollen area. To use, stretch the injured area, then apply the fingers directly over the swelling or bruising and the solid end over the area you want the fluid to drain to. Wear the tape 24/7 for 3-5 days. Each package contains 15 precut edema strips. Each strip is 2" wide x 8" long and is precut into 5 individual tails. 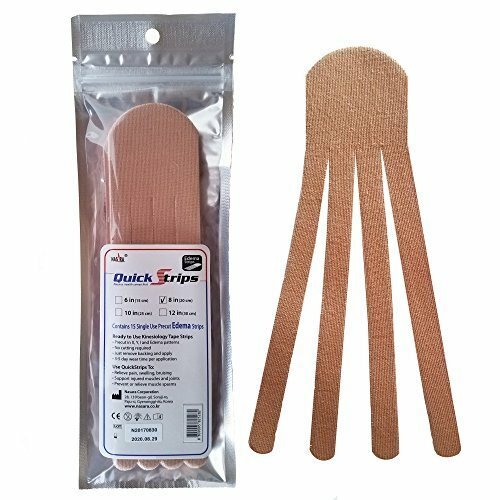 Made from high quality cotton with a latex-free, acrylic adhesive that is safe for all skin types. Contains no medicinal or pharmaceutical ingredients. Each application can be worn 3-5 days and stays on through bathing, showering, swimming or sweating. If you have any questions about this product by Nasara, contact us by completing and submitting the form below. If you are looking for a specif part number, please include it with your message. Athletic Tape for First Aid Kit, Physical Support Therapy, Sports Exercises. Lower Back, Heel, Foot, Joint, Shoulder, Muscle and Plantar Fasciitis Pain Relief. 20 precut Light Blue KT strips 2”x10"